It’s October, and that means it is Cyber Security Awareness Month. This is a time to reflect on the issues, and to think about what role you play in ensuring that your own, and the University’s information resources, are secure. 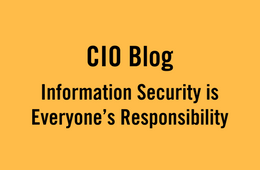 Read Information Security is Everyone’s Responsibility at U of T’s CIO Blog.